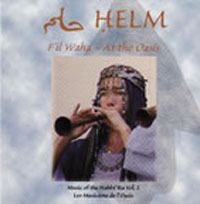 This CD contains a varied collection of music played on assorted traditional instruments by Helm, the band that accompanies the popular San Francisco dance company named Hahbi 'Ru. Several of the songs on this album are ones that Hahbi 'Ru uses in its performances of Middle Eastern folkloric dances. Some of the songs are traditional melodies, while others are original compositions by the members of Helm following the traditional style. Some of the songs on this album are traditional music. Others are original songs composed by the members of Helm based on Middle Eastern rhythms. All songs fit well with an ethnic flavor, regardless of whether they're long-time Middle Eastern favorites or fresh material. I don't think I would have known which was which just from listening - I needed to check the liner notes to find out. The traditional songs do not represent any one particular locale - they have been drawn from a number of places throughout the Middle East and North Africa. F'il Waha features a variety of musical instruments, all of them acoustic. Even the percussion is varied, using several different styles of drums. Some of the instruments used on this album are well-known among dancers: the mizmar, kanoun, and ney. Others, however, were new to me. As a result of listening to this collection and contacting Mark Bell of Helm with some questions, I learned that a kawala is a type of flute similar to the ney, and a zumara is a reed instrument. Helm is a small ensemble. On any given song, there are no more than 3-4 musicians playing at once. This gives the intimate feeling of listening to a group of friends playing around the campfire. This music would lend itself well to American Tribal Style dancing, folk dance choreography, historical re-enactment events where sound systems are allowed, and any other situation where music with a historical flavor is appropriate. Some of the songs on this collection are well suited for beginner practice and classroom use, with simple melody lines and rhythms. If cut to 3 1/2 minutes or less, they could also be good for beginner performance and choreography. Others use more complex rhythms such as samai or have melody lines with breaks that would be better suited to more experienced dancers. Garbabas 4:15 Morocco No No Primary instrument is the kawala (a type of flute). Playful. Good for beginner practice or class because of steady rhythm, consistent melody, medium speed, but a bit too long for beginner performance. 4/4 rhythm. Insabah 4:45 Egypt Yes No Played on mizmar. Strong melody would make it great for sword. Masmoudi rhythm. Raqs li Shams 2:33 U.S.A. No Not applicable Played on zumara and kawala. Maqsoum rhythm, medium speed. Varied melody but steady, consistent rhythm. Waqt il Asil 3:16 U.S.A. No Not applicable Played on kanoun. Recommend only for advanced dancers because primary rhythm is samai (10/8). Lorke Lorke 2:16 Lebanon Yes Instrumental Played on mizmar. Spirited debke rhythm. Jamilo 2:48 Yes No Played on rebaba and kawala with female vocals. Playful and fun. Gradually builds to a faster speed. F'il Waha 3:55 U.S.A. No Not applicable Played on mizmar, 9/8 Turkish Gypsy rhythm with 2232 accents. Starts slow, picks up speed. Huriyah 4:53 U.S.A. No Not applicable Chiftetelli rhythm. Ney (a type of flute) plays for the first minute, then kanoun takes over. Good for standing undulations, balancing, or floor work. Raqset il Olall 4:03 U.S.A. No Not applicable Played on mizmar. Medium fast 4/4. Has breaks, so probably not a good choice for beginning dancers. Raqs Siri'a 2:08 No No Played on the mizmar. A spirited and fun song, played in a fast maqsoum rhythm. Not for beginners because of speed and accents. Dukhan 4:21 U.S.A. Yes Not applicable Opens with a strong melody in masmoudi rhythm. Gradually speeds up into maqsoum rhythm. Would be wonderful for a sword dance that begins with floor work and transitions into standing hip articulations. Magaree 4:24 U.S.A. No Not applicable Opens with 30 seconds of melody played on zumara and kuwala, then percussion takes over with a spirited, exciting drum solo. Asal 2:39 U.S.A. No Not applicable Played on the mizmar. You have a passion for music with a traditional, ethnic flavor. You enjoy performing folkloric dance. You're already a huge fan of the San Francisco dance companies Hahbi 'Ru and FatChance Belly Dance, and you'd like to use some of the same music they do. You like the sound of a small band playing on acoustic instruments, especially mizmars and flutes. You enjoy the deep, heavy sound of a drum known as the tabla baladi. Your favorite costuming style involves coins, tassels, turbans, and tunics. You enjoy a variety of Middle Eastern rhythms, including more challenging ones like Turkish 9/8 and samai (10/8). You enjoy dancing in the context of historical re-enactment events such as Renaissance Faires and Society for Creative Anachronism. You're not interested in doing folkloric performances. You dislike mizmars and zurnas. You have a passion for 20th-century Arabic music played by large orchestras of the type common in Egypt. Your favorite musical style is the modern-day pop music played in nightclubs. You like a lot of electronic synthesizer sound in your music. You're biased toward using music from "over there" that Middle Eastern people know and recognize. Some of the songs on here are traditional, but many have been composed by the musicians featured on the album. The musicians use a number of different traditional instruments, but stay true to the folkloric sound throughout. The result is that you could assemble an entire show from this collection of songs -- they sound good with each other, yet the diverse instruments and rhythms would provide nice variety within a full-length production. There is a mix of different rhythms. This includes some songs that are simple enough to be nice for beginners, yet others such as "F'il Waha" and "Waqt il Asil" that would enable more experienced dancers to demonstrate the range of their skills. I was delighted to discover that this collection contained a song ("Waqt il Ashil") in the samai rhythm that was composed by one of the members of Helm. I've been fascinated by this difficult rhythm for a long time, due to many years of musical training, and I admire anyone with the musical skill to compose a song that uses it. About half of the songs are longer than 4 minutes. This makes them harder for dancers to use, because often we must assemble shows that are no longer than 10 minutes. If we want to do a 3-part (fast-slow-fast) routine, then we need to figure out how to cut songs that are longer than 3 or 3 1/2 minutes. Also, it's not easy to teach choreography to long songs because students find it hard to memorize the steps to a song that's much longer than 3 minutes. This music is well suited to dancers who enjoy a folkloric type of sound, particularly those who wish to dance in Renaissance Faire environments. It is representative of the sound used by Hahbi 'Ru (including some of the songs actually used by Hahbi 'Ru) and Bal Anat, and therefore should appeal to people who want to dance in the vintage pre-FatChance style of California tribal. After one of their Renaissance Faire appearances, John Compton of the dance company Hahbi Ru invited me backstage with him to meet the musicians and the other dancers, and that's when I first met Mark and Elizabeth Bell, the lead musicians of Helm. Since then, we've known each other well enough to chat when we see each other at dance events, though I don't claim to know them well. Mark sent me a copy of this album for review. We've had some follow-up e-mail discussions regarding questions I had about it.